Texting and Driving: Another DFW municipality applies the brakes on the practice. Attorney Jeff Rasansky discusses this new law and what it means to commuters. I'm glad to see that cities in North Dallas are doing what the Texas State legislature has not been able to yet accomplish. Everyone knows that texting and driving is a dangerous practice, and more states and municipalities throughout the United States are passing laws that ban the practice. While Texas doesn't have a state law banning texting and driving, several DFW municipalities (such as Arlington, Grand Prairie, and now Farmers Branch) have passed their own laws. Drivers who text and drive in spite of its dangers can now remove another Texas municipality from the list. Last month the Farmers Branch City Council passed an ordinance banning the use of wireless devices for text-based communications while driving. The distracted driving ordinance was presented to the council in March and first appeared on the agenda for the March 3 study session. There was no problem with the ordinance passing through council; its passage made Farmers Branch the third North Texas city to implement a ban on texting and driving. Even though the agenda item in Farmers Branch agrees the bans on texting and driving in Arlington and Grand Prairie are predominantly symbolic and geared toward focusing on an educational awareness campaign in an effort to reduce the number of accidents that occur because of texting and driving, they admit it is better than not having any kind of ordinance at all. The goal for Farmers Branch is to combine the ordinance with an educational program in order to encourage changes in driver behavior within the city and make drivers aware of the dangers they face by texting while they are driving. The city wants to make sure residents and visitors to the city are aware of the new law before they implement it, so while it is currently in effect, drivers are given a “grace period” of 90 days. There is no provision in the ordinance at the present time regarding how much the ticket will cost drivers who break the law. 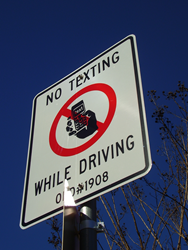 The terms of the ordinance are quite simple: anyone who is driving is forbidden to send, receive, or read text messages. This refers to everything including reading writing, and sending email, posting or reading any type of communication or messages on social media sites, accessing the internet, or using any applications on a smartphone with the exclusion of voice activated GPS directions. While the proposal that was submitted to the study group in March acknowledges the difficulty of knowing how many accidents are actually caused as a result of drivers staring at their phones, Farmers Branch is aware of the danger. In 2012 and 2013 there were eleven accidents in Farmers Branch in which drivers actually admitted to distractions from cell phone use: talking on the phone, texting, or looking at their GPS. A city employee lost his leg in a 2013 accident in which a driver admitted she was looking down at her cell phone. So far in 2014 there have been two accidents that resulted from cell phone use, including a driver who hit a cyclist because he was distracted while looking at the GPS feature on his mobile phone. Approximately 25% of car crashes involves driver distraction, and drivers who operate their vehicles while using cell phones are obviously at a greater risk of collision than those who don't. "It's simply not worth it," says Dallas attorney Jeffrey H. Rasansky. "I'm glad to see that cities in North Dallas are doing what the Texas State legislature has not been able to yet accomplish." Attorney Jeff Rasansky is a car accident lawyer based out of Dallas, Texas. Form more information on car accident law, visit http://www.jrlawfirm.com/.